Haha, my 23 year old borders have never been dug. I have a gardening friend who always digs between the plants in autumn. In spring she is complaining about loss of plants. I told her many times, but according to her she has to dig the garden before winter, otherwise she does not feel well....... So many men, so many minds. But in summer the same digging people ask how we manage to get such a nice borders. Your border looks great in summer and so do your grass, I cannot say that with a border collie making a race track of the grass. Good to have the benefit of your experience Janneke. I love your english turn of phrase. I have friends like yours! I'm not big on aeration either. I just dig holes, put the plant in and mulch. Seems to work for me. Thanks Cher. I think almost everyone who has a quality garden knows that this is how you get best results. I agree about the mulch. Your summer border is a beauty Roger. The more I read and see about your no dig philosophy the more I am beginning to understand. My latest blog contains a method of soil aeration that you choose to turn a blind eye too! Yes, your mole! What an amusing piece you have written about it on your blog! Roger, presumably even if you don't lift and divide the plants you do cut down their foliage (as evidenced by your last photo). When do you do this? I mean, at what point in the year.. Autumn? Spring? I cut down my herbaceous borders at home in January or February. 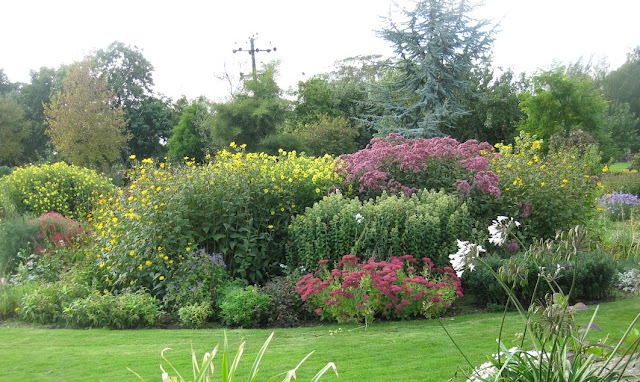 I do also have lots of herbaceous plants on the village plot and in the two cemetery gardens. There I tend to cut back (with my petrol hedge trimmer) as plants start to become untidy and have nothing left to offer. This works out at me cutting back perhaps November to March depending on the plants -and my energy! Brenda insists I am rather tidier at home. I once considered aerating the perennial garden but then thought...if it isn't broken, why fix it? Every year it returns lush and beautiful. Occasionally I'll move something here or there and divide to plant elsewhere. Good thinking Carolyn. I do like you and occasionally move the odd plant to improve the design. I do not subscribe to the traditional view that herbaceous borders need replanting very three years! In fact although herbaceous borders have the reputation of being labour intensive I think the opposite and herbaceous perennials are my favourite plants. Oh yes Sue, just under an acre! I am longing to get in there when these cold winds subside. Why don't you come and see it for yourself on my open day in mid July- that is if you can tear yourself away from blogging and gardening! Actually fellow bloggers like yourself are welcome anytime. I'll take you up on that when the weather improves - hopefully it should have by July!!!! I am fascinated by this. I have recently (last December) moved into a new build home with newly laid turf. I was intending to dig a large herbaceous border in one corner but having done some minimal planting in the front I'm aware that the soil I have been left with is very heavy shaley clay, with a very minimal amount of topsoil for the turf to root into. I was really not looking forward to digging it but I now have a glimmer of hope. I have 3 shrub roses to put in put the rest will be mostly perennials in 1-2 litre pots. Do you think this will be feasible? For me not only feasible, but normal. This post has had a sudden new burst of activity and I have been looking back. What on earth did I mean with my last comment. Must have been drinking!